tvRSS lets you subscribe to "season passes" of TV shows (like TiVo) that automatically update with the latest episodes of your favorite shows. Combine these RSS feeds with a BitTorrent client, and you have an automated system for downloading TV shows. You can find feeds for hundreds of shows including Lost, Brothers and Sisters, Eureka, and Entourage. 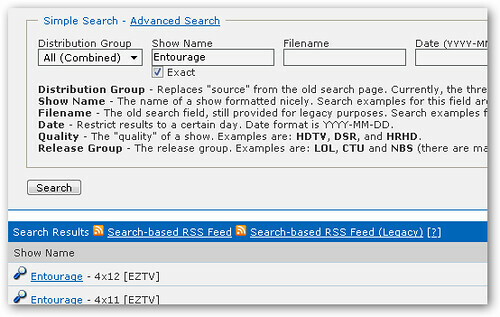 Just copy the link for the RSS feed (labeled "Search-based RSS Feed") and paste it into your favorite torrent client. In µTorrent, you would paste the feed URL into Options > RSS Downloader. Torrent Episode Downloader works similarly to tvRSS except that it's an application (not a website) that connects directly to your BitTorrent client to automate downloads. Needless to say, while tvRSS may not be entirely legal, it will certainly appeal to the lazy leecher demographic.